Launched on July 25, 2014, MoneyPot introduced a Bitcoin-powered website that stands out from the rest with its multiplayer and social game. “The game has gone through some major changes since then,” said Eric Springer, the programmer behind MoneyPot. 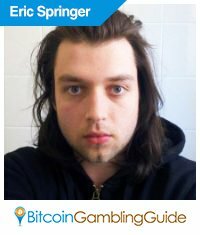 Eric, who is originally from Australia but is currently living in Mexico, detailed how MoneyPot has become a unique addition to the Bitcoin gambling market in our exclusive Bitcoin Gambling Guide interview. How would you describe MoneyPot to new customers? Money Pot is a multiplayer Bitcoin casino game, wherein everyone makes wagers when the game is going to crash. It has a multiplier, which starts at 1x and increases rapidly from there. At any point you stop, you get the multiplier, but it’s important to stop before it’s too late, or you get nothing. No one can predict when the game will “crash”, but there is a reward scheme for out-lasting your peers. In that sense, it’s a very multiplayer and social game. It’s a unique game. Who created the software for it? I did, it’s all custom software. It’s just the web for now, although a number of players have toyed with the idea of making alternate client, especially for Android. What are the qualities that make MoneyPot different from the other Bitcoin gambling brands? I think Money Pot is unique in a few senses. It’s one of the few games where it’s possible to play +EV, which means you can actually expect to make a profit. This depends entirely on your peers’ style of game play, as you are competing directly against them for the bonuses. But many players have made a few bitcoins playing for profit as opposed to pure luck. The other thing that makes it unique is that everyone is playing the exact same game, which I think creates a much better social game for everyone, as you really have a shared experience. The third and more subtle point is Money Pot doesn’t have a fixed house edge, which encourages a more dynamic style of game play. On one hand, the house edge is smallest (effectively 0%) if you cash out very early, but you normally will miss out on the PvP bonuses (resulting in an expected return of -1%). And if you cash out very late, the house edge will start to approach 1% but makes it more likely you’ll be able to secure the PVP bonus, unless you hold too long. And finally, I’m the only open source bitcoin gambling game I know of! You’ve covered several aspects advantageous to your brand, but how has the process of managing it been so far? The operation’s side of things has been extremely demanding, which has really made it hard for me to improve the site at the rate I’d like. Things are looking a bit better now though. The variance is also rather insane; it’s hard to have a stable business when you have such unpredictable profits. Hopefully this will smoothen out with more players. You mentioned variance. How has the growth of Bitcoin gambling benefit the online gambling industry? It’s great for players! Casinos have been forced to offer extremely thin house odds, which very few people truly appreciate how brutal they are. In fact, if I had understood how insane the variance is at such narrow margins, I likely would have a different business. Right now my site is sitting on a net profit of -9.1 BTC, whilst a couple days ago it was +11. Do you believe cryptocurrency positively affect us or the business? It truly lowers the cost of entry for a lot of businesses, especially something not entirely mainstream like a gambling site. If I had to go through the traditional route of being a licensed establishment, Money Pot wouldn’t have been possible. Interesting. Would you mind sharing your plans or other details you wish your potential customers to know? I try to be the most transparent gambling operator out there. I routinely provide data dumps on request; the source code is open source. I have lots of plans, but my #1 priority for the moment is just strengthening the core game and making it as solid as possible. Thank you very much, Eric. I absolutely wish MoneyPot well.